The siting of tank farms close to the Tin Can Island seaport, one of the busiest ports in the country, and residential areas in Apapa , Lagos has become a source of worry for many residents in the area. Experts have cautioned that due to the combustible nature of tank farms, siting them in such an area pose danger. Their fear is that in case of fire outbreak, the entire Tin Can Island, Apapa, and Ajegule area of the state would be endangered. Most residents of the area told TheEconomy that they now live in fear because their lives and properties will not be safe if there is any incident of fire outbreak given the location of the tank farms close to their houses. According to them, several appeals to the government that the tank farms be relocated because the area was originally designed for residential purpose have failed to yield the desired result. Some “powerful” Nigerians acquired the land originally meant for residential purpose and built the tank farms not considering the danger it pose to port and residents of the area, they fumed. Lately, the fear of the residents heightened when a tanker conveying fuel exploded just by one of the tank farms. The accident which claimed about 20 persons caused pandemonium in the whole of Apapa area. Initially, many had thought that the explosion was from one of the tank farms. Adefunke Ajayi, a resident of Apapa, said many of the residents scampered for safety, thinking that the evil day had come. It was later discovered that the explosion was not from the tank farm but a fuel tanker which just loaded fuel from one of the tank farms. Gbenga Egunjobi, manager of Beachland Estate, Apapa, said that most of the tank farms were built several years after the construction of the residential buildings in the area including Beachland Estate which is beside one of the tank farms. “I wonder why the government will allow such awaiting danger in an area as crowded as Apapa? You don’t see this in other parts of the world. Tank farms are located in the outskirt of the town and cities for safety reasons,” he said. Alex Brain, a marine consultant, stressed the need for tank farm operators to be vigilant and comply with safety rules. “The location of tank farms is a waiting disaster; there is no security of lives and properties around the area for now until they are moved out of the place. Government should urgently relocate the tank farms from residential areas so that we can have peace and security,” he said. Mr. Rasaq Fadipe, director, Lagos State Fire Service, said he had on several occasions called on the federal government to relocate the tank farms from Apapa to other parts of the state. Fadipe said tank farms are highly combustible and could explode with the slightest fire. He however stressed the need to relocate the tank farms in the area to fallow lands. “We have lands in the Ibeju-Lekki and Badagry axis, if the tank farms are relocated to such areas, it will open up development in those places,” he said. The Senior Staff Association of Communications, Transport and Corporations (SSACTAC) Nigerian Ports Authority (NPA) Apapa branch, and the Road Transport Employees Association of Nigeria (RTEAN) have also called on the federal government to, as a matter of urgency, relocate petroleum products tank farms away from the seaport environment to protect lives and properties. Omeiza Umar, President of SSACTAC NPA branch, said that the federal government should relocate the farms to Snake Island and other Islands where the activities of the operators will not affect the wellbeing of the people. “We will be glad if government can relocate or ask tank farm operators to site their farms outside residential and commercial areas, they should go to places where, if there is explosion, it won’t affect the activities of the people. Lives and properties of Nigerians should not be at the mercy of tank farm operators. 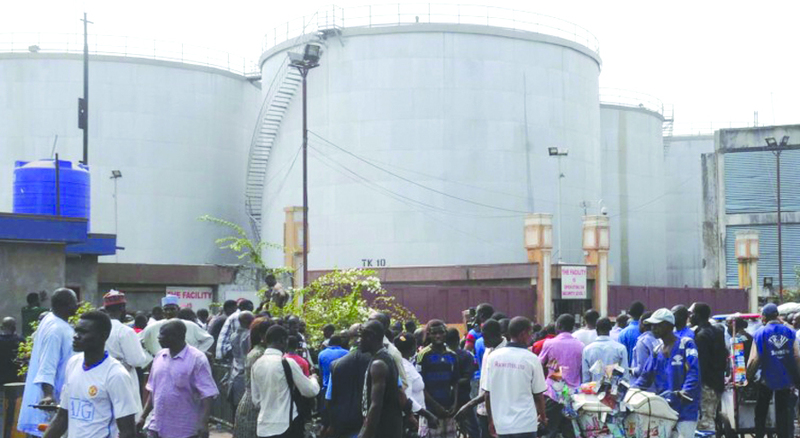 We are worried about the proliferations of tank farms around the port area,” he said. To him, no amount of safety measures will be able to contain explosion from tank farms. Isiaka Olalere, chairman of the Tin Can Island chapter of RTEAN, attributed traffic gridlocks and the numerous wastes of man hours on the busy Oshodi-Apapa expressway to the concentration of tank farms in the area. “In the past when there were no tank farms around Apapa, there were no traffic gridlocks on the road, but now there are at least 45 tank farms between Berger Cement and Apapa. How then do we expect the roads to be free? Though these various farms have truck terminals but tankers can’t stay in their terminals to load fuel. For instance, if ASCON Petroleum is to load 50 tankers today, MRS 50, Integrated 50 etc, that is about 250 tankers on the road in a day. How do we expect the road to be free,” he queried. In 2011, the Senate Committee on Maritime Transport frowned at the siting of petroleum products tank farms within the ports. The team led by Senator Zaynab Kure, chairperson of the committee, said the damage an accident from one of the facilities could cause the country would be incalculable if the federal government fails to take precautionary steps. It is noteworthy to say that despite all these appeals, the federal government has failed to act. However, a manager of one of the tank farms who spoke on condition of anonymity told TheEconomy that there is no reason the people should demand for the relocation of the tank farms when the necessary safety measures have been taken by their various managements. According to him, the tank farms are fire-proofed against any explosion.